August 1 issue includes annual statistics package. 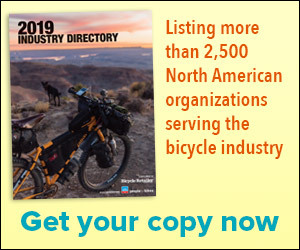 LAGUNA HILLS, Calif. (BRAIN) — The U.S. bike industry employs more than 71,000 people and generates $6.5 billion in annual sales. Bike advocates are wielding numbers like that when they visit Capitol Hill in search of support. LAGUNA HILLS, Calif. (BRAIN) — The July 1 issue of Bicycle Retailer & Industry News has landed in mailboxes. LAGUNA HILLS, Calif. (BRAIN) — Join the BRAIN crew on the roads and bike paths of the Beehive State in the June 15 issue, featuring our Salt Lake City Dealer Tour. LAGUNA HILLS, Calif. (BRAIN) — The May 1 issue of Bicycle Retailer and Industry News is arriving in mailboxes this week, and subscribers now have the option to receive a dynamic digital edition of the magazine. LAGUNA HILLS, Calif. (BRAIN) — The April 15 issue of Bicycle Retailer & Industry News, arriving in mailboxes this week, features an in-depth examination of retail bike pricing, inspired by the reduced pricing promotion announced by Giant USA last month.